WASHINGTON, D.C. -- Russian President Vladimir Putin is counting on the Sochi Olympic Games to boost his country's image around the world, but the games' success or failure may be just as important to his flagging popularity at home. A majority of Russians (54%) still approved of the job Putin was doing as president in 2013, but this is 29 percentage points lower than the approval rating he received at the end of his last presidency in 2008. Putin left the Russian presidency in early 2008 with high approval, although this was well ahead of the economic crisis that reverberated throughout the world -- including in Russia -- later that year. It was also the last year a majority of Russians (63%) believed their country's leadership was taking Russia in the right direction. After that, Russians' economic confidence crumbled. Since then, less than half of Russians have believed their leadership was headed in the right direction, and the rest have thought either that leadership is headed in the wrong direction or they don't know. At the same time that Russians began to express more doubt about their leadership, Putin's approval ratings started to slip, although he still earned 77% approval in his new role as prime minister at the height of Russia's recession in 2009. Then-President Dmitry Medvedev -- the other partner in the power tandem -- debuted with a relatively lower 68% job approval rating that same year. Although both leaders' approval numbers remained well above a majority, Putin's and Medvedev's ratings each fell into the mid-to-lower 60s in 2011, with Russians' rising discontent evident after the parliamentary elections in December that year. The allegedly flawed elections sparked unprecedented anti-Putin protests, with thousands demonstrating in Moscow. While Medvedev ended his presidency with 58% approval in March 2012, Putin's rating had dropped to 54% by October. And this lower rating followed Putin's election as president amid allegations of widespread fraud, which spurred more opposition protests that ended in riots and hundreds of arrests. 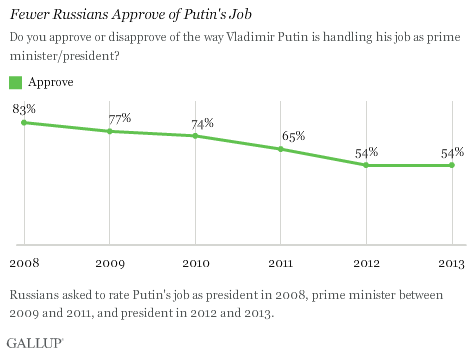 Putin's rating remained this low a year later, but it appeared to stabilize at 54%. Putin has characterized his country's Olympic preparations as "one of the most significant anti-crisis measures in the country." Although Putin was speaking economically, the games could also be one of the most significant anti-crisis measures for Russians' failing confidence in their leadership. Read about Americans' deteriorating views of Russia and Putin prior to the Olympics. Results are based on face-to-face interviews with 2,000 adults, aged 15 and older, conducted July 8-Aug. 3, 2013, in Russia. For results based on the total sample of national adults, one can say with 95% confidence that the maximum margin of sampling error is ±2.7 percentage points. The margin of error reflects the influence of data weighting. In addition to sampling error, question wording and practical difficulties in conducting surveys can introduce error or bias into the findings of public opinion polls. Most Russians are looking forward to the Olympics that start next week in Sochi. However, the majority, particularly residents of the South region, anticipate the games will increase corruption. Half of Americans now see Russia as an unfriendly nation and 54% view Vladimir Putin negatively. But they widely approve of the Russian plan for Syria's chemical weapons and view Putin's involvement as helpful.